It’s 9:30 a.m. on Saturday morning and I’m still in bed. My wonderful husband, V usually entertains the children on Saturday mornings and let’s me sleep in because he’s awesome like that. That, and a well-rested mama puts the weekend off to a good start. We had previously woken up at 7:00 a.m. to the sounds of the 6-month old and despite my hopes of a sunny, warm day where we’d carpe diem and go to the market in town, or even the world-renown botanical garden nearby, we were welcomed to a raining, cold morning, so I turned over and went back to sleep. The doorbell wakes me the second time. Apparently, there’s an unfamiliar Dutch man in my entry way and I can hear my 2-year old daughter repeating “Hi! Hi! Hi!” at a rapid pace, attempting to make friends with the man. V is instructing him what to do, I hear the sound of the hand-held debit card machine, a few dank u wels, and the heavy door shuts behind him. I smile and I am so happy. I pad downstairs, rubbing my eyes, wearing my p.j.s and favorite slipper socks imported from Old Navy and I’m welcomed to a frenzy only equated by the excitement of a happy Christmas morning. My kitchen is filled with 4 crates full of groceries. There are cans of beans, fruit, and tomatoes. There is baby formula, wipes, diapers, and jars of food. There are two entire flats of water – sparkling and still. There is a large bag of dry dog food. There are 12 rolls of toilet paper and paper towels. There’s fresh fruit, a loaf of bread, slices of cheese and ham, bottles of beer, bottles of wine, eggs, milk, chicken, and ground beef. My family is already hard at work rummaging through our plunder and putting each item in its proper place. I can’t believe my luck. After months and months of trying to understand the system, beat the system, accept the system, becoming one with the system, I believe now, we have finally, conquered the system. At a small cost. So you might be asking yourself what’s the big deal? Well, let me explain. Grocery shopping in Texas with two small children: You drive to the store with your two kids in the back-seat. You park near the cart return. You grab a cart from the cart return, load your 2-ish year old in the seat of the cart, take the baby carrier and put it in the main part of the cart. You peruse the aisles, stuffing whatever you can around the (hopefully) sleeping baby in the carrier. You check out while the children are becoming restless. You quickly push the cart out to the car, unload the groceries, perhaps realize you forgot to put X item on the conveyer belt because it was hiding underneath X month-olds baby carrier – ponder cost-benefit of being honest and going back into to pay for small package of sliced cheese. Screaming escalates and you realize, if was DVD, alarms would have gone off, it’s just cheese. It should be okay. You place small, screaming children into car and drive home. Park in covered garage, and unload groceries at one’s convenience. Perhaps, after screaming children have been attended to, and gone to bed. This is not an easy task, I admit. But, it has its advantages and the beat-down of the task has been completed for the week. Grocery shopping in The Netherlands with two small children: You just. Don’t. Just kidding, but no, really – it’s a completely different mentality. I may be wrong, but I would assume that in most of Europe, grocery shopping is a daily task. The grocery stores are small, but they have everything. They really do, well, except for cornmeal. I’ve apparently bought cornstarch and breadcrumbs in the process of trying to find it, but anyway. . . Instead of 100 cartons of sour cream to choose from, they have 2, so it takes a while to actually SEE everything they have. Because of the small quantities on the shelves, the stock boys and girls are required to restock the shelves constantly, every aisle and every hour of the day, which results in more maneuvering between the already skinny aisles. The produce is extremely fresh, which is really awesome, but it goes bad within four days of purchasing, if you’re lucky. So there’s no real point in trying to stock up on a lot of fruit, veggies, milk, or bread. (Believe me, we’ve tried!) The other caveat of the whole process is that you have to bring your own bag and bag your own groceries. What’s the big deal, you say? Well, the real key to the process is that the line doesn’t stop. In America, the checker scans your groceries, a 16-year old is bagging or if you’re really in a good mood, you help. You have $150 worth of groceries and everyone is pitching in, you, the bagger, and perhaps, the checker to get you on your way. Your cart is packed and you smile and exit the store. In The Netherlands, the big difference is, the line doesn’t stop and you’re responsible. Your groceries are at the end of the counter. You have to bag them (in the bags you brought). You’ve got to stop bagging and pay, when it’s time. The 7-foot tall Dutch man behind you who’s been bagging his own groceries since he was 5 is breathing down your neck and doesn’t understand why the Stupid American A. buys 50 Euros worth of groceries at a time or B. Doesn’t know how to pack her own groceries with military efficiency. 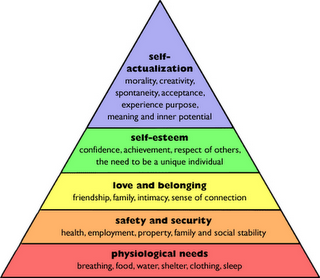 It’s stressful and hectic, and all the while, you’re just trying to meet Maslow’s first level of the pyramid. After you’ve bagged your own groceries, the final kicker is taking them home. There are groceries stores you can drive to and park your car, and drive home, but they are few and far between. So, typically, you must take into consideration what you want to carry home, physically. Usually this takes the form of carrying the bags on your shoulders, stuff into the stroller, or perhaps, what you can load on your bike. We eat more rice than potatoes because I just don’t want to carry potatoes home. I’ve also learned that bottles of water are heavier than bottles of wine. We’ve tried all sorts of combinations. Because of the tiny aisles and constant restocking of the shelves, I refuse to take the double stroller into the Jumbo, so maybe that’s a mark against me for not even trying. But come on…can you imagine? That would be as convenient as driving an F150 around the Macy’s parking garage at the Dallas Galleria on Black Friday. I’ll save myself the embarrassment. Once, I tried shopping while pushing the 2-year old in the umbrella stroller and put the baby in the sling. That worked out okay, but trying to pack your own groceries while wearing a baby was kind of ridiculous. The road in front of our local Jumbo grocery is apparently for buses only. We tried to just ‘drive by and drop me off to run in and grab milk’, but we got caught in a maze of bus only lanes and were chased by an angry local bus like ‘Frank’ (the combine in the movie ‘Cars’), inches from our tail pipe – “What are you doing here?? – NO cars allowed, just buses!” There was a quick flash from a police camera during our panicked escape (please, no ticket!) and we haven’t done that again. Thus enters the Albert Heijn grocery delivery service, into our lives. Our pantry is stocked without the usual physical and psychological demands of shopping with two small children in this country. Simply order what you want online, pick a delivery day/time and Presto, the groceries magically arrive into your kitchen. I smile as I sip my coffee and remove the carton of milk from the pantry that my 2-year old placed there during the unpacking process, and put it into the fridge where it belongs. Maslow would be proud. Maybe we can start climbing the ladder now. Now that we have successfully celebrated Christmas in April, let’s take a step back in time and discuss how and why it is that my happy family of two adults, two children (ages 1 ½ & 3 months at the time of departure), and two dogs, after a tornado, or rather, a hurricane of frenzy hurled ourselves across the big blue ocean and landed amongst spinning windmills and colorful tulips. The year was 2006 and I was an internal auditor for American Airlines. It was my dream job, for an accountant. I will never admit to loving accounting or any such other wild claims, but as far as the accounting world goes, I was paid to audit airports around the world, which is pretty much like being a Pan Am stewardess in the 1960’s, without all the glamour or chauvinistic comments. I flew from Dallas to well, everywhere. International & domestic – La Guardia, Nicaragua, Tyler, Brazil, Charleston, Curacao, and Zurich, just to name a few. In addition to the interesting job, I also had flight benefits. Now, total disclaimer – this means that I only paid taxes on the flight (sweet!) but flew stand-by. If there was room on the flight, then I could go. There were tools to determine how full a flight should be – but as we all know, not only are the flights extremely packed these days, but if there’s a delay, a mechanical difficulty, crew problems, etc. then, as an employee, I was put on the bottom, bottom, bottom, of the list. But anyway, the point is, that I was able to tag along with my boyfriend, V (later to become my fiancé and husband) on his business trips for fractions of the cost of a full-fare ticket. As part of our trip, I was determined to see Clusius Botanical Garden in Leiden and the pottery factory in Delft. V went to work and I, along with my Lonely Planet Netherlands Guidebook and tattered copies of the novels that sparked the quest, stepped onto the train in Rotterdam and headed north. I gazed out the window at the countryside. The beautiful green fields around me were speckled with cows and windmills. It was fresh, clean, and peaceful. My first departure point was Leiden Centraal Station. It’s funny to think about it now since we live a 5 minutes walk from there. I stepped off the train, walked down the crowded stairs, and was greeted by a smell of French fries and fresh bread. With a confused and curious look on my face, I exited the station and started walking towards town. I admired the beautiful original architecture and canals of the city. Unlike Rotterdam, which is a city sadly bombed heavily during the war and filled in its canals during the 60’s, Leiden has much of the traditional Dutch-style architecture still in place. I fell in love with Leiden instantly. I continued my walk down the brick sidewalks. The town was coming alive for the day. The canals reflected the morning sunlight, and to my surprise and relief, I easily found my way to the botanical garden. I was almost to the entrance of the Botanical Garden and it hit me. A bolt of energy enough to make my head snap back and stop my determined pace, and I knew. . . I repeated the message I had just received, in a whisper. “I’m going to live here someday.” What in the world? Are you serious? I had received these energy-type things had before, but not often. I had no reason to doubt the truth of the statement, but live here?!? How likely is that really, and how in the world is that going to happen? With a raised eyebrow, I was excited and anxious to see how it was all going to pan out. 2008 – Big year. V and I get married and apply for an international rotation with his work. THIS is it. I just know it. We’re going to move to The Netherlands this year. I also had a dream that were going to have a baby girl. Come to find out, neither one of these things were going to pan out for us this year. The economy tanks after we happily say I do and well, let’s just say things just didn’t go well for us in the baby department, either. I. Was. Heartbroken. Crushed. Pretty much a complete, and total disaster. A friend of mine (who was currently on a rotation in London) offered me unforgettable advice: “Just because you didn’t get the rotation THIS TIME. Just because you didn’t have a baby THIS TIME. Doesn’t mean it won’t happen in the future.” I read her e-mail through watery eyes, nodded, decided to breathe, and try again. My saddened heart told me I needed a change and to prepare our lives for the family we wanted. I knew that flying around the world wasn’t exactly conducive to a family life, so I turned in my AA badge for an 8:30-5:30 extremely stable, predictable, and quiet job in a cube. We bought a beautiful house that could host holidays for my family and provide shelter for V’s family during hurricane evacuations. It has 4-bedrooms, so plenty of room for whoever else might come along during the years to come. July 2009 - V and I are back in The Netherlands for 4th of July weekend. I had two very important missions for this trip (okay, three if you wanted to include finishing the novel, Twilight – gah! I know – but I just had to know what all the kids were talking about). I wanted to meet my husband’s grandmother – his mother’s mother. V’s mother passed away just a few weeks after we started dating and although I never met her, I miss her terribly. I know that there is symmetry in me entering his life, just as she exited, but still. I felt that meeting her mother was important for the future of our family. I also wanted to take V to Leiden. I had explored the city on my own the previous visit and I wanted to show him the town. Luckily, he loved it, too. We walked to the Botanical gardens then sat on a docked boat in a canal in the early afternoon and sipped Palm beers. He took a few pictures of me as we sat there, with the Town Hall in the background. At the time, I had let him in on my little ‘secret’, but I’m not sure he had the unwavering optimism, determination, or faith in my energy-flash-insight things, like I did. After months and months of on-line searching, and a frustrating day of International House Hunting in January 2012, V calls me from The Netherlands. I am still in Dallas, wrapping up my job and the move. He is starting his job and searching for our new home. He has toured through the houses in Rotterdam and Delft to no real answer. He gets on the computer, one last time, and expands the search to include Leiden. It’s about a 45 minute commute, but according to a fellow Expat he recently met, it’s totally doable. We find it. THE house. It’s in Leiden and it’s perfect. He tours it the next day and signs the lease papers by the end of the week. So, that’s how we came to live in Leiden, The Netherlands, with two babies in tow. It definitely would have been easier with just the two of us a few years ago. It would have been easier to stay in Dallas as a family of 4. But if neither of those options were what the plan was all along, and I guess who am I to argue? Blessed and excited, I’m looking forward to what the next few years will bring. According to weather.com, it’s 42 degrees outside in Leiden, The Netherlands, but “feels like 34 degrees”. I have ‘my favorites’ on the weather center’s website to show the temperatures in Leiden, Plano, and Denver (where my sister lives - just for fun) simultaneously at the top of the page. Currently, it’s 79 degrees in Plano, Texas. And it’s 6:00 a.m. there right now. I sigh and shut the computer and look out the window into our small, but quaintly landscaped backyard. The leaves on the trees are finally starting to grow after months and months of blooming. This has been the longest spring I have ever seen. The sky is gray, a continuation of gray from the past 3 days. It’s drizzling. It may feel like 34 degrees, but I feel like this drizzle could turn to snow any minute now. Of course, this Texan knows little about cold, wet, climates. I almost wish it would turn to snow. If it has to be this cold and this wet, it might as well be pretty. I woke up this morning, well, my final wake up – my 6 month-old has been having trouble sleeping. And as any parent of a 6-month old, you know that means you could possibly be up anywhere from 1 to 7 times (or more, if they’re motivated!) in the middle of the night as well. But alas, I digress. I woke up this morning knowing that I was not going to leave the house today. I have been a stay-at-home mom for 13 weeks now, which, not surprisingly, corresponds with the exact number of weeks we have lived in Leiden, The Netherlands. I have a Masters in Accountancy. I sat for AND passed the CPA exam. I have 4 ½ years of public accounting experience. I’ve been to 6 continents. I’ve hiked through jungles and swam through caves in Belize with a flashlight on my head. I had an 11-hour layover in Paris by myself, climbed the Eiffel Tower in the French drizzle, lit a candle at the Notre Dame, and high-tailed it back to Charles De Gaulle in time to catch my flight to Ethiopia. I am a capable and motivated woman. I fiercely love my husband, children, and dogs. But today, I am not leaving the house under these conditions. I simply, refuse, and I knew that, the moment I woke up. So, in celebration of the record-breaking, coldest-I’ve-ever-been-in-April-wintry-mix we have looming outside our windows, my 2-year old daughter and I watched Charlie Brown Christmas this morning. She goes down for her nap, and now I have my favorite Christmas CD playing in the kitchen. It was a gift for, well, Christmas from my college roommate. A mix CD of all her favorite Christmas songs and I’ve played it more times than I should probably admit, since we landed at Amsterdam Schiphol Airport on January 21st. I’m cleaning bottles when “ Baby It's Cold Outside” kicks off the CD. I couldn’t agree more. Well, honey, as I’ve learned, in order to stay warm, you need to wear tights under your jeans at all times and a jacket so thick that feel like you're wearing a freakin’ comforter. Top it off with a hat, scarf, gloves, and weatherproof boots tall and wide enough to go over your tights, and skinny jeans – and you’ll be warm enough to walk home in any weather! Stay if you’d like and fall for his advances, or get yourself a new wardrobe. I put the bottles in the microwave to sterilize and Silent Night starts playing. I wearily eye my 6-month old as he plays in his exersaucer on the other side of the kitchen. Don’t I wish. I’ve already spent an hour today trying to figure out how to find/import Enfamil Gentlease formula into The Netherlands (you can’t). And trying to research (again!) if the major Dutch brands of formula have types of formula for fussiness or gas, with the help of Google Chrome automatic translate function. He’s so hungry all the time and spits up a lot. We first tried the hongerige baby (hungry baby) formula. But that did not sit well with him. So, we went back to normal and he started spitting up constantly. So, then we tried the anti-regurgitation formula – which was basically the consistency of gak or mud – which resulted in a lovely evening of a record-breaking 8 times waking up during the night. The other problem is, that the Dutch are so-anti-formula and pro-nursing, that they aren’t even allowed to advertise formula for babies under 6 months old. No information available. So, after an hour of searching, all I found, much to my dismay, no formulas for anti-gas or fussiness or colic, just formula for food allergies, which I don’t think, is quite the solution. Who knows? I don’t miss A LOT of things about America. . . but Enfamil Gentlease would be on the top of the list, followed quickly by good Mexican food that I don’t cook myself. I start to prepare my daughter’s snack for when she wakes up from her nap. A beautiful, lovely song by Sara Bareilles is next on the rotation. “Winter Song” rings through the car stereo that’s been implanted into my kitchen cabinets. The owners of the house remodeled a few years back and updated the kitchen with a car stereo and speakers. It apparently was a less expensive way of putting a stereo in the kitchen. The Dutch are very economical like that. Either way, I like it; although, the CD player gets so hot, I fear for the life of my CDs when I play them. Anyway, as I was saying, Sara's delicate voice resonates my fragile and fatigued soul – “This is my winter song to you. The storm is coming soon. It rolls in from the sea.” (We are about 10 minutes from the beach, so yes, the storms are always coming!). Then her sweet, angelic voice continues, “This is my winter song. December never felt so wrong. (okay, I admit, I thought she said December never felt so long until I looked up the lyrics. Freudian slip – but it works. I’m feeling December in April, either way), she continues, “You’re not where you belong” (debatable). I’m smiling and mesmerized by the melody. It’s just gorgeous. I shake myself from my daze. My daughter is crying upstairs. I run up the 18 super-steep stairs to the 2nd level. (Although the Dutch call the bottom floor, floor zero, and the next floor the 1st floor, etc. Potentially very confusing when the movers are here delivering your furniture and you have 3 floors total. . . .) I bring her downstairs and now I’m sashaying around the tiled floor to "Pennies from Heaven", much to the delight of my 6-month old son and Border Collie, Dash. Dash has grabbed his pink dragon (imported from the US and honestly, I’m not sure how much longer it’s going to last – similar to the kids clothes) and is hopping around happily. Tyler, my German-Shepard mixed dog is preoccupied with guarding my daughter during snack time in the dining room. I can’t help but picture Buddy The Elf when this song plays. He’s excitedly discovering a new world and then spins himself silly through a rotating door until he vomits into a trash can. Buddy and I have more in common than I originally thought. Hum. A host of other Christmas classics accompany my daughter and I through our ‘cooking time’ where today, we bake a Spice Cake. I had originally planned to bake chocolate chip cookies (apparently, non-existent in this country, and I’ve been craving them for months!) but I’m out of butter. Well, they don’t really have butter sticks here, either. But anyway, we don’t have any butter, and, as stated before, I refuse to walk to the store today with two kids in the double stroller, and consistent with our Christmas theme, making the house smell like cinnamon sufficed, anyway. . .